Ford updates its Mondeo range | What Car? 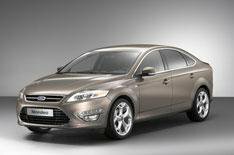 Ford has announced a host of upgrades to its Mondeo family car. The most obvious changes centre on the car's styling inside and out, but also extend to new engines, as well as a host of new comfort, convenience and safety features. Following changes to the Galaxy and S-Max earlier this year, this completes the company's revisions to its whole large-car family. The changes apply to both the five-door hatchback and estate versions of the Mondeo, and include new grilles, a revised bonnet profile and LED daytime running lights. Along the side, there's a new full-chrome window surround on higher-spec models, while the rear has larger, new-look LED taillights. The cabin uses new higher-quality materials, with a new look to the centre console, and flush, integrated release mechanisms in the doors. In keeping with the higher-quality feel to the interior, there are high-class trims and new 'jewel' detailing on switches and vents in satin chrome. Among the new interior colour schemes are two new lighter tones that, Ford says, give the car a rich, premium, appeal. The revised Mondeo is the first Ford in Europe to get the more powerful 237bhp version of the 2.0-litre Ecoboost engine that is already used in the S-Max and Galaxy in 200bhp form. The Mondeo will have the engine in both states of tune. Using the latest technology, this engine is according to Ford capable of fuel consumption and emission reductions of up to 20% compared with conventional petrol engines of a similar performance. In the Mondeo, both versions have CO2 emissions of 179g/km. The Ecoboost engine is joined by a reworked version of the 2.2 diesel engine, which now produces 197bhp, making it Ford's most powerful Duratorq diesel engine to date. This will be available alongside three versions of the 2.0-litre diesel engine, ranging in power from 113bhp to 161, all of which produce 139g/km of CO2. In the future, 1.6-litre versions of both the Ecoboost and Duratorq engines will join the range, while among the new Econetic features to boost fuel economy are Smart Regenerative Charging, the Ford Eco Mode driver information system and, for the first time in a Ford model, an Active Grille Shutter system. Also available in the Mondeo for the first time will be a host of features introduced in the Galaxy and S-Max, including Ford's Blind Spot Information System, Speed Limiter, Rear Door Power Child Locks and Rear View Camera. The new models will go on sale in September, with prices for remaining the same as the existing line-up, and starting at 17,295. The only change is that Titanium models increase in price by 200 because of the extra standard equipment.